Whether one is in North America, Europe or Asia, the Passover seder is almost always familiar due to the universal text of the Haggadah. Through the course of time, however, different communities have developed customs that are unique and beautiful. In preparation for Passover, Jewish Treats presents a few interesting variations of one such custom. The fourth step of the seder is the breaking of the middle matzah, which is known as yachatz. Among Jews of Syrian descent, the middle matzah is specifically broken into the shape of the Hebrew letters daled and vav. The origin of this custom is related to kabbalah (Jewish mysticism). The letter daled represents the number four, while vav is the number six. Together they represent the Ten Sephirot, the mystical powers that bind the structure of the world together. Among North African Jews, there is a similar custom of breaking the middle matzah into the shape of the letter hey. Hey not only represents God’s name, but it is also the first letter of the Aramaic passage in the Haggadah that begins Hah Lach’ma Ahn’yah. (“This is the bread of affliction that our ancestors ate in the land of Egypt. Let all who are hungry come and eat...”) The matzah broken into the shape of the hey is passed around to be held over one’s head as each seder participant recites the Hah Lach’ma Ahn’yah paragraph. The custom of having each seder participant personally recite Hah Lach’ma Ahn’yah is also found among Persian Jews. Instead of the broken matzah, however, the Persian Jews pass around the three matzot of the seder table wrapped in a white cloth. I know thirteen. Thirteen are the attributes of God’s mercy. Twelve are the Tribes of Israel, Eleven are the stars in Joseph’s dream. Ten are the Commandments. Nine are the months until a baby is born. Eight are the days until the brit milah (circumcision). Seven are thedays of the week. Six are the tracts of the Mishnah. Five are the books of the Torah. Four are the mothers (matriarchs), and three are the fathers (patriarchs), and two are the tablets of the law. And one is our God of the heaven and the earth. Although “Who Knows One” presents some basic Jewish facts (the holy books, the matriarchs and the patriarchs, etc. ), its recurring verse, “One is our God of the heavens and the earth,” is a poetic rendition of Judaism’s most fundamental prayer: Sh'ma Yis'ra'el A'doh'nai Eh'lo'hay'nu A'doh'nai Echad. “Hear O Israel, the Lord is Our God, the Lord is One" Deuteronomy 6:4). This Treat was published on March 18, 2013. Ask your older relatives what customs they remember from Passover seders when they were young. Before the destruction of the Holy Temple, most Jews traveled to Jerusalem to offer the Pascal lamb. Because the entire lamb had to be eaten, it was the common practice for several families to purchase a lamb and partake of the festive meal together while retelling the Exodus story, discussing the Midrashim (legendary commentary on the Torah) describing the Exodus, and reciting the ten plagues. These early seders also incorporated the other basic mitzvot of the seder: eating matzah and maror (bitter herbs) and drinking four cups of wine. After the Second Temple was destroyed (70 C.E.) and the Jews dispersed, the oral law was written down (Mishna and Talmud) in order not to be lost to future generations. Among that which was written down was the basic outline of the Passover Haggadah, including the order of questions and discussion (Mah Nishtana - the Four Questions).The oldest existing Haggadah that we have today is from 8th or 9th century Palestine. While there have been modifications and additions over time (as people have added prayers of devotion and songs of praise), the basic form of the Haggadah has not changed. With the advent of the printing press in the Middle Ages, the Haggadah text was set, based on the prayer book of Rav Amram Gaon, who headed the Babylonian Yeshiva of Sura between 856-876 C.E. While certain parts of the Haggadah, such as Chad Gad'ya ("One Kid"), were not added until much later, the basic text of the Haggadah has remained the same to this day. This Treat was published on March 19, 2013. This Treat was published on March 20, 2013. Invest in a new Haggadah to gain further insights into the Passover seder. 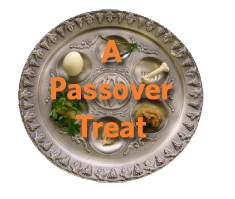 While most Jews have attended a Passover seder, no Jew in the last 1,900 plus years has tasted a Paschal lamb ("Korban Pesach"), the animal offering associated with Passover that shares the holiday's name. The Paschal sacrifice was offered on the day before Passover and was eaten that evening at the seder - but only when the Holy Temple stood in Jerusalem. And while no Jew today can offer and eat the Paschal lamb, it is interesting to note that in Temple times, a Jew who deliberately avoided partaking of the lamb was viewed as having denied an essential connection to the heart of Judaism. One of the most unique aspects of the Paschal sacrifice is the prohibition against breaking any bones of the animal during its roasting or eating. The anonymous author of Sefer Ha'chinuch suggests that the reason for this negative commandment is a lesson on the effects of manners. A person is supposed to eat food with dignity. As breaking and eating bones is the way a dog eats, humans are reminded to rise significantly above that level. On a deeper level, however, Sefer Ha'chinuch stresses how all actions contribute to a person's character. One who regularly does good deeds will become a good person; conversely, one who allows himself to participate in dishonest actions, will eventually be overtaken by dishonesty. It may begin with how we eat, but it translates into how we live. Our actions, even the breaking of bones, mold us and define us. This Treat was published on March 22, 2013. Kitniyot (Legumes) - During the holiday of Passover, Ashkenazim follow a rabbinic decree not to eat foods containing kitniyot, such as rice, corn, soy beans, string beans, peas, lentils, peanuts, mustard, sesame seeds and poppy seeds. This rule was established because these products are often stored together with chametz grains, making it difficult to ensure that there is no chametz mixed with the products. Also, when kitniyot are ground into flour, the untrained eye could mistakenly think that this it is real flour, giving the impression that such flour is permitted on Passover. The decree only prohibits the eating; products containing kitniyot do not need to be sold with the chametz. This Treat was published on April 4, 2014. Arrange to purchase a shankbone for the seder from you local kosher butcher. This Treat was published on April 11, 2014. Enjoy your challah this Shabbat. Next week it’s matzah! The first known inclusion of Chad Gad'ya in the actual Haggadah can be traced back to 1590, in Prague. 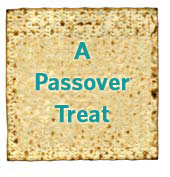 Begin purchasing matzah and other kosher-for-Passover foods. This Treat was last posted on April 8, 2014. Free your schedule to celebrate Passover next weekend. According to the Midrash, Pharaoh was alerted to a prophecy that the Israelites would be led to freedom by a boy yet to be born, so he ordered all newborn Jewish boys cast into the Nile. Yocheved set her newborn son (Moses) adrift in the Nile in a basket, where he was found by Pharaoh's daughter, who adopted him. This Treat was published on April 7, 2014. 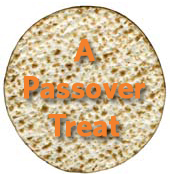 Prepare fun activities as a way of teaching the Passover story to the young people in your life. All food items that are actually chametz must be consumed before Passover, given away, thrown out or otherwise removed. Chametz may also be sold through a rabbi to a non-Jew. For more details, please consult your local rabbi. *Certain items, depending on the material, maybe kashered or may not need to be covered. This Treat was published on March 31, 2014. Begin preparing for Passover by separating out your chametz (leavened products) to be eaten. Did you know that the mother of women’s basketball was Jewish? Senda Berenson revolutionized women’s athletics. Ironically, Berenson,* who was born on March 19, 1868, in Vilna, was a sickly child. When she was 7 years old, she emigrated to Boston, Massachusetts. Berenson’s delicate constitution made school difficult for her. She left school before receiving her high school diploma. Choosing to follow the art-focused career path of her older brother, Bernard, who had become a renowned art historian, Berenson enrolled at the Boston Conservatory of Music. Here again, her physical ailments proved to be an impediment. She was unable to dedicate herself to either music or art, because the long periods of practice caused her discomfort and exhaustion. In 1890, even though she had not finished high school and was in poor physical health, Berenson was granted a place at the new Boston Normal School of Gymnastics, which taught a Swedish form of athletics. By the end of her first year, Berenson’s health was significantly improved. Before completing her second year, she was hired as a replacement gymnastics teacher at Smith College. Early in her tenure at Smith, Berenson learned of the new basketball game developed by Dr. James Naismith. She decided to teach it to her classes at Smith. The young ladies enjoyed it so much that Berenson arranged the first all-women’s basketball game. As popular as basketball was, Berenson realized that the men’s version of the game was a bit rough, so she modified the rules (e.g. no stealing the ball, a limit of three dribbles, etc.). Her rules for women’s basketball, which she honed over a number of years, remained in use until the 1960s. Berenson remained active in Women’s basketball and general athletics even after she left Smith College in 1911. In 1985, Berenson was the first woman inducted into the Basketball Hall of Fame. She was also inducted into the International Jewish Sports Hall of Fame in 1987, and the Women’s Basketball Hall of Fame in 1999. Berenson passed away on February 16, 1954. *The family’s original name, Valvrojenski, was changed by her father, Alfred, when he came to America. Keeping one’s body fit helps one fulfill the mitzvah of taking care of one’s health. The third book of the Torah, Vayikra/Leviticus, focusses on the sacrificial rites that were an integral part of Jewish life until the destruction of the Holy Temples. For many Jews of modernity, sacrifices are difficult to fathom. Within the sacrificial laws, however, there are many subtle lessons that are pertinent even today, when there is no Temple. Leviticus 5:17 states: “If a person sins and commits one of the commandments of the Lord which may not be committed, but he does not know, he is guilty, and he shall bear his transgression.” The Talmud specifically states: “If there is a doubt whether he had committed the transgression, [he is liable to bring] a doubtful guilt-offering” (Keritot 2a). Many people have trouble admitting being wrong. It is often much easier to see other’s faults or to presume someone else is to blame. From the laws of the “doubtful guilt offering,” one might appreciate the lesson of being willing and prepared to admit that in situations of dispute one might have been guilty of instigating or conflagrating the situation and, perhaps, be willing to take the first step of offering an apology. If you know that you have hurt someone, call them or send them a note to apologize. The first royal recognition of a Jewish presence in Ireland was in 1232, when King Henry III gave Peter de Rivall the office of Treasurer and Chancellor of the Irish Exchequer, the king's ports and coast, and also "the custody of the King's Judaism in Ireland." However, in 1290, all Jews were expelled from the English kingdom, which included Ireland. By the end of the 15th century “Anousim” (Jews forced to hide their Judaism because of the Spanish Inquisition) began to settle on the Emerald Isle. In 1555, William Annyas, a Jew, was elected mayor of Youghal, County Cork. One of the most famous Jews of Ireland was Robert Briscoe (1894-1969), who became the Lord Mayor of Dublin in 1956. Active in the IRA and Sinn Féin during the Irish War of Independence, Briscoe was a nationalist who was adamant that being a "Hebrew" did not lessen his Irishness. Since 1993, the New York based Emerald Isle Immigration Center sponsors the annual Briscoe Awards, which honors Jewish leaders for their work in bettering the lives of Irish immigrants to the U.S.An Irish Jew who became a leader to the Jewish people through his distinguished career in the Israel Defense Force (and previously in the British army) was Chaim Herzog (1918-1997). The sixth president of the State of Israel was born in Belfast and raised in Dublin, where his father, Rabbi Isaac Herzog, who later became the second Chief Rabbi of Israel, was Chief Rabbi of Ireland. This Treat was last posted on March 17, 2009. Find a way each day to celebrate your Jewish heritage. Although born in Hungary in 1904, Rabbi Yehoshua (Joshua) Menachem Ehrenberg was living in Cracow when the Nazis began their systematic destruction of European Jewry. The city of Cracow, which was brought under German control in September 1939, had a significant Jewish population that was inflated by an influx of Jews from the surrounding area. While the Nazis initially tried to force Jews out of the city, it was decided in late 1940 that a ghetto be established. By March of 1941, Rabbi Ehrenberg, already a well-respected scholar, along with the rest of the Jewish population, had been relocated into the ghetto. Although it is not publicly recorded how Rabbi Ehrenberg survived, it is known that he was one of the approximately 1700 Jews included in the “Kastner Train” in June 1944 This transport, which consisted of 35 cattle trucks, was arranged by Rudolph Kastner, who quite literally paid Adolph Eichmann for Jewish lives. After arriving safely in Switzerland, Rabbi Ehrenberg decided to settle in Jerusalem. He was not there long, however, before he acceded to Chief Rabbi Isaac Herzog’s request that he provide religious guidance to the Jews interned by the British on the Island of Cyprus. One can only imagine how difficult it was to return again to barbed-wire enclosures, but Rabbi Ehrenberg dedicated himself to his new role and returned to Israel on the last ship, only after the camp was dismantled in February 1949. Settling in the city of Jaffa, Rabbi Ehrenberg continued to dedicate himself to his Torah studies and to serving his community. He was appointed Av Beit Din (head of the religious court) in Jaffa and was considered an expert on Jewish divorce. Rabbi Ehrenberg’s published responsa are known as Teshuvat D’var Yehoshua. The yahrtzeit of Rabbi Yehoshua Menachem Ehrenberg was yesterday, 24 Adar. Don't hesitate to make small sacrifices for the sake of the community. The “fruit of the vine,” as wine is poetically called, is a rare synthesis of nature and Judaism's philosophy of free will. Everything in a person's life can be used for good or for bad. For instance, wealth can be hoarded or used to help others. This is exactly the reason that wine is used for Kiddush. Through drunkenness, wine can easily lead one away from Godliness, so instead we bless it and use it to sanctify God's name. In moderate amounts, wine leads to pleasant happiness. In excess, however, wine can lead to anger, the total loss of inhibition, depression, etc. *Wine is the ideal. However, if one does not like wine or may not drink wine, grape juice is often used as an alternative. For the daytime Kiddush, one may also use other beverages such as whiskey. Try some kiddush wine or grape juice at your local Shabbat Across America and Canada location, TONIGHT! If you can't attend tonight, here are ways to do Shabbat Across America and Canada At Home! This Treat was last posted on March 20, 2009. NJOP and Jewish Treats wishes you Shabbat Across America and Canada Shalom! Yah Ribohn Olam is a very popular Shabbat song in Jewish communities around the world. Written in Aramaic by Rabbi Israel Najara (Syria, 16th century), Yah Ribohn Olam describes the wonders of God's creation and concludes with hope for the redemption of the Children of Israel and the restoration of Jerusalem. Its chorus is: Yah ribohn olam v’ahlma’ya, ahnt hoo malka melech malchaya - O Creator, Master of this world and all worlds, You are the King who reigns over Kings. To read the complete text of Yah Ribohn Olam and to listen to a variety of tunes, click here. To read the complete text of Tzur Mishelo and to listen to a variety of tunes, click here. This is the power of Shabbat Across America and Canada - celebrated this year on Friday night March 13, 2015. Synagogues across the continent are readying themselves for this grand evening by inviting Jews from all backgrounds to come celebrate their identity, to join in with the community and to reconnect with their spirituality. This Treat was last posted on September 4, 2009. If you are making Shabbat Across America and Canada At Home, don't forget to sing about the beauty of Shabbat. Shabbat, the Jewish day of rest, is a unique opportunity to spend “quality time” with one’s friends and family. One way of doing so, particularly on long Shabbat afternoons, is by playing games. * Since the day is structured by specific “dos and don’ts” designed to secure the holiness of the day, Jewish Treats presents some general guidelines to ensure Shabbat-friendly play. Another important factor in choosing a game for Shabbat is whether or not writing is required. Writing is one of the 39 melachot - “creative labors” prohibited on Shabbat. Although this rules out games such as Pictionary™, many games one associates with writing can still be played with small adjustments. For instance, one can play Clue™ using one’s memory rather than by writing notes, which also makes for a more challenging game. The biggest issue of games and writing on Shabbat is the question of keeping score. Here too, the challenge is easily overcome with a little creative thinking. Some people use a book to bookmark the page number of their score. Others use playing cards to keep count of their points. Playing cards is another excellent example of Shabbat-friendly activity. Most games are fine to play on Shabbat (but not for money!). The main caution in playing cards on Shabbat is the temptation to sort the deck to make certain that the deck is complete or to deliberately remove certain cards, such as the jokers, which could be a problem of bo’rayr (taking the bad from the good). This Treat presents just a brief look at Shabbat-friendly game playing. 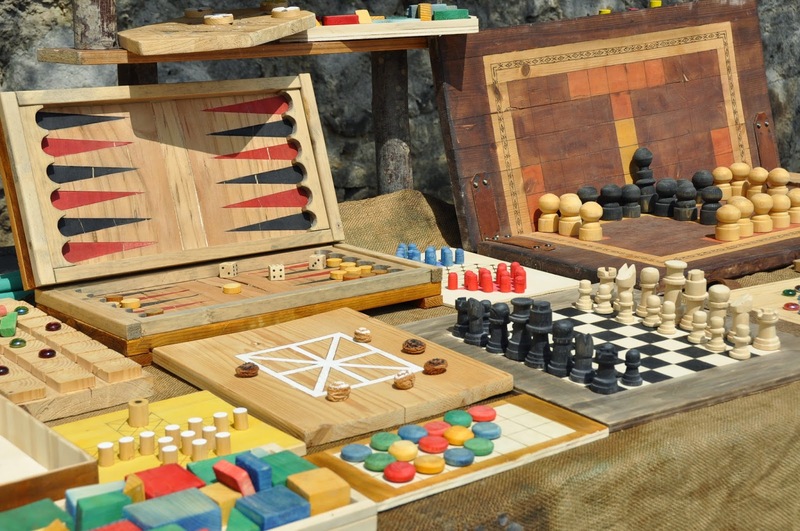 Different games may present other questions about which one can (and should) ask one’s local rabbi. *Please note that this Treat refers only to board games, not ball games. Attend a Shabbat Across America or a Shabbat Across Canada event this Friday night and meet new friends with whom to spend Shabbat. The Shabbat table is customarily set for a grand feast and adorned with one’s most beautiful utensils. Beyond beautiful settings, however, there are certain “essentials” that are traditionally purchased to enhance the Shabbat table. 2. Kiddush Cup: Kiddush is the blessing of sanctification that declares the Sabbath day to be holy. The cup used for kiddush must contain at least 3 fluid ounces of wine or grape juice. Kiddush cups come in a range of sizes and styles and are most often crafted in silver (although some are glass). Some distribute small amounts of the kiddush wine to family members and guests in mini-kiddush cups. 3. Challah cover: It is customary to cover the challah (braided Shabbat bread) with a special cover during the recitation of kiddush. There is a remarkable range of beautiful challah covers available, with some people preferring a velvet cover, while others choose painted silk. There are even leather challah covers. 4. Challah board and knife: After the blessing of ha'mo'tzee, the challah is cut and distributed to all present. Challah boards are made from a variety of materials (wood, glass, marble, etc). It is also customary to have a special Challah knife with a decorative handle. All of the above items can be found at your local or online Judaica store. While it is traditional to purchase silver candlesticks, kiddush cups and challah knives, there is no obligation to do so. This Treat was last posted on March 16, 2009. If you are unable to attend a Shabbat Across America and Canada location, try Shabbat Across America and Canada at Home. Ahad Ha'am (Asher Ginsberg, poet and Zionist ideologue: 1856-1927) is quoted as saying, "More than Jews have kept Shabbat, Shabbat has kept the Jews." This statement is part of the key to the great puzzle of our generation: how to keep Jews Jewish? We have survived exile and genocide, only to find that assimilation and a lack of Jewish knowledge have become an even greater threat. One of the greatest benefits of Shabbat has always been family and community. On Shabbat people attend synagogue together, mingle with their neighbors, pray together and connect with each other. As Jews began to assimilate and the world became more “savvy,” the idea of a day of rest fell out of favor. Either people were too busy with their work, too busy with their play or too worried about being different or missing something. By abandoning Shabbat, people relinquished their precious connection to their community (and to the Divine). And without a connection to their community, Jews increasingly disappeared from the Jewish radar. This Treat was last posted on March 18, 2009. Find a Shabbat Across America or Shabbat Across Canada location near you (click here for NJOP's location search). This Treat was last posted on March 17, 2014. In just over seven maidens (next week, Friday March 13, 2015), the Jews of North America will celebrate Shabbat Across America and Canada. This Treat was last posted on March 6, 2014. Purim leftovers are great for Shabbat dessert. Esther lived with her cousin, Mordechai, in Shushan, the capital city. She was chosen for the contest because she was particularly beautiful, and was selected to be queen. Mordechai instructed her not to reveal her Jewish identity. This Treat was last posted on March 16, 2014.